Softbank is now the biggest investor in India’s startup space. It owns large chunks of five of India’s most prominent unicorns, Flipkart, Paytm, Ola, Inmobi and Snapdeal, and also has investments in other startups, including Oyo, Grofers and Housing. In the last three years, Softbank has pumped in $6 billion (Rs. 40,000 crore) into Indian startups, leading observers to wonder if it has a seemingly infinite supply of capital. But it turns out it sort of does — Softbank has war chest of $175 billion. And it’s earned it the old fashioned way. Over the last 18 years, Softbank has managed to turn a $11 billion investment into an astonishing $175 billion. 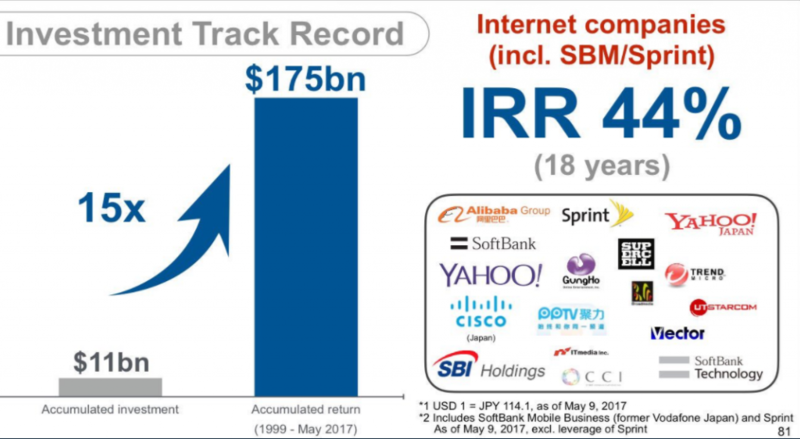 For its internet companies, Softbank claims to have an internal rate of return of 44%, meaning on average, Softbank managed to earn a 44% annual return on its investments through the period. In comparison, the typical savings bank account earns 4% annual return, while Fixed Deposits earn around 8%. But Softbank is exceptional even by standards of Venture Capital firms, which earn 25-30% annually. Softbank’s managed a 15x return on its investments by investing in large companies when they were starting out. Its most famous investment is Alibaba, which it had first invested into all the way back in 2000. Over the years, Softbank has invested $58 million into Alibaba, but thanks to Alibaba’s explosive growth, that stake is now worth $130 billion, which is a 2240x return on its original investment. Softbank isn’t a one trick pony — apart from Alibaba, the company has invested into several other successful businesses. Softbank is an investor in Yahoo Japan, which remains on of the bright spots in Yahoo’s largely failing roster. Softbank also has investments in other prominent companies, such as networking giant Cisco and American telecom company Sprint. Softbank, though, isn’t resting on its laurels. Earlier this year, it announced a $100 billion Vision Fund, which would invest in technology startups. The size of the fund has surprised many industry experts, who wonder if it is possible for a company to deploy such large sums of capital and continue to earn high returns. But Softbank has continued to plough ahead with its investments, most recently investing in Uber. Interestingly, Softbank is also an investor in Ola, which competes with Uber in India. And Softbank also is an investor in Flipkart, Paytm, and Snapdeal, all of which compete against each other. When you have a $100 billion war chest, you don’t have to worry about backing the right horse — just about any horse that’s in the running will do.